I work as a fisheries specialist in the Solent and South Downs team. The Environment Agency and our partners recently set out a long-term plan to help conserve salmon stocks and this is an important part of my job. The Salmon Five Point Approach states that improving salmon survival in the marine environment is crucial. In recent decades NASCO (North Atlantic Salmon Conservation Organisation) has had an international monitoring programme to collect fisheries data, genetic samples and verification of the salmon numbers being landed by the West Greenland salmon fishery. This is a significant opportunity to gain scientific information from this mixed stock fishery before the fish are sold for the dinner table. Salmon have an amazing life cycle, migrating up to 3,000 miles to feed before then returning to the river they were born in to spawn. It’s this journey that led me to Greenland. I was lucky enough to get funding from Defra to help conserve this iconic species. I was one of six people based in five different ports monitoring salmon landings in West Greenland for two weeks in September 2016. 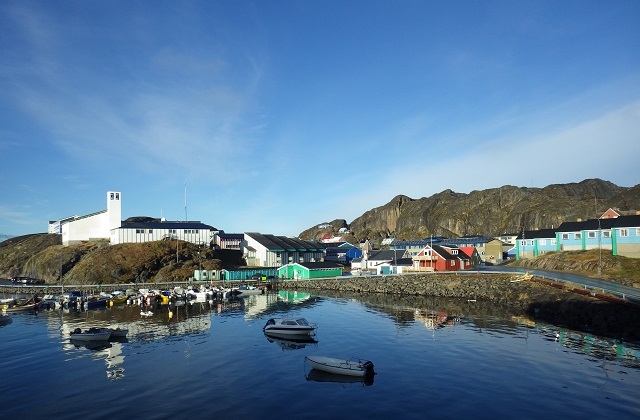 I was based within a small island community, Maniitsoq, which is known as the Venice of Greenland, with smaller islands joined together to form a harbour, a small container port and cod processing factory. Greenlandic culture, and the remoteness of communities results in a reliance on natural resources leading to a salmon quota. In 2015, based on data from past salmon sampling, NASCO agreed with Greenland a salmon quota of 45 tonnes each year for three years (which is significantly smaller than historically). The salmon are sold solely to feed the local community, who rely significantly on what the sea and coastal landscape can provide, filling their freezers for the long winter months. The salmon fishery remains vital to the people here given the high prices of importing food by air or sea. The flight over Greenland allowed me to appreciate the scale of the expansive wilderness with glaciers ending in fjords on the west coast. The salmon fishing season here is relatively short running from August to October inclusive, with the fish caught by nets set amongst the fjord network, where they are feeding. It was a challenge to get the required samples from the salmon before they were whisked away to be sold, or de-scaled under a high pressure hose before filleting. It was my job to collect scale and fin samples from the salmon. By taking scale samples it tells us where the fish has come from, how quickly it has grown indicating how well it is feeding (which we can also understand better from measuring the fish’s length and weight) and how much time it has spent in the river and at sea. On some rivers (including some in England) where research is carried out salmon caught when they are in the river are marked by cutting a small notch on the adipose fin (the fin furthest down the back of salmon) called a fin clip. Scientists choose to mark this fin because it tends not to get damaged when the fish are caught in nets. For those fish with a fin clip a search for secondary tags was necessary, which can be either internal or external. Coded wire tags were searched for with what is essentially a metal detector and the areas around the eyes were searched for coloured tags. Of the six adipose clipped fish I found, unfortunately despite a thorough search of each fish, I didn’t find any tags. This was disappointing as tags can provide significantly more insight into the life history of an individual fish. My other key role was to count the number of salmon actually landed so as to have accurate landings data for the dates that I was in Maniitsoq. 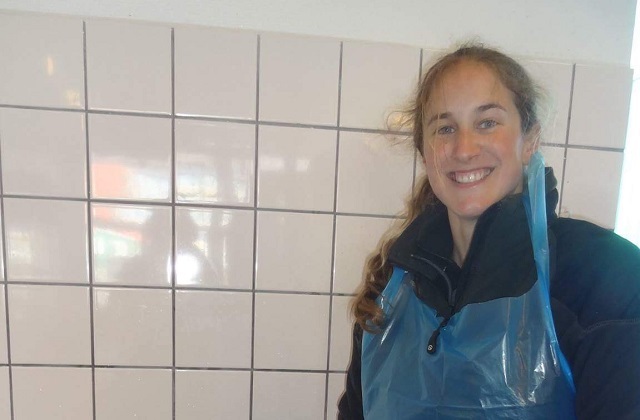 In total I took samples from more than 500 salmon, with an average length of 65cm and an average weight of 3.02kg. The largest was 91cm and 8.25kg. As for the results of these efforts, the samples I took are now back in the USA to be analysed, so we shall wait and see what they tell us about the salmon caught in West Greenland's waters in 2016. In 2015 this monitoring work showed that 20% of the salmon landed in West Greenland were of European origin. Even when the salmon have left UK waters, we are still working hard to ensure that salmon are surviving their epic migration to come back to their home rivers.